China Trade Week kicked off in Nairobi yesterday at the Kenyatta International Convention Centre (KICC). The expo is expected to attract over 400 Chinese companies across various industry sectors including building and construction, lighting, machinery, consumer electronics, energy, auto parts, furniture, home electronics, kitchen & bathroom, textiles, stationary and jewelry. 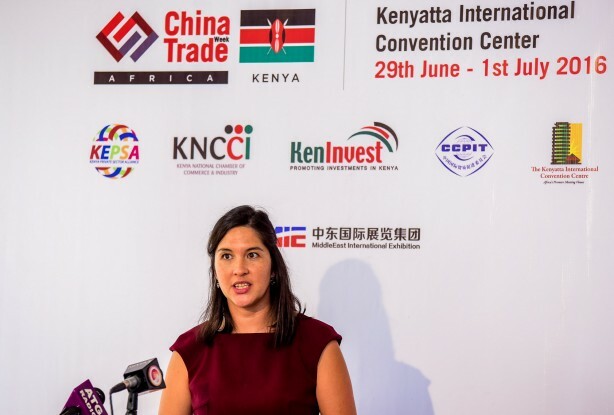 Speaking during the official opening, Michelle Meyrick, International Events Director, said MIE Events said the three day Expo will create stronger ties between Chinese companies and Kenyan businesses keen on sourcing products and services from China. “China Trade Week welcomed over 16,500 trade visitors to the 2015 edition and this year we hope to double those figures, as we have done with the number of exhibitors. During the event, productive business meetings took place, facilitating high-levels of networking between Kenyan and Chinese business operators,” she said. Available figures show that as at2013, China’s cumulative direct investment in Kenya had soared to USD474million while bilateral trade volume had reached USD8.4billion the same year. Currently Kenya imports is estimated at over USD14billion yearly which consists primarily machinery, transportation, equipment, petroleum products motor vehicles and plastics. The Expo is organized by MIE Events; organizer of trade fairs in Dubai and China, the trade week is the only comprehensive China-focused trade event to be hosted in Kenya and the East Africa region.